TORONTO ZOO, Toronto ON, Wednesday, December 27, 2017: The Toronto Zoo is proud to announce that Zohari, a seven-year-old female white rhinoceros (ceratotherium simum), gave birth to a male calf on Sunday, December 24, 2017 at 10:45pm. Both mom and baby are doing very well, with reports that this first-time mom is very restful, calm and protective. The calf is notably big and strong, weighing in at 62.3 kg. He has been nursing more than would be expected, and apparently has very hairy ears. PLEASE NOTE: access to the maternity area of the White Rhino Habitat is not permitted at this time. Toronto Zoo staff will provide updates, photos and video as they become available. No filming/photography will be permitted. This recent birth is very important for white rhinoceros conservation as the species is currently listed as Near Threatened on the International Union for Conservation of Nature (IUCN) Red List of Threatened Species. There are approximately 19,682 – 21,077 left in the wild according to the IUCN African Rhino Specialist Group 2016. At one point, the species was as low as 20 animals left in the wild in South Africa’s Umfalozi Game Reserve but they were brought back from the brink of extinction through amazing conservation efforts. Their listing as Near Threatened is due to the continued increase in poaching for their horn in the black market trade. The population is heavily dependent on range state protection and if this is not maintained, the population could be upgraded to Vulnerable or even worse. A white rhino’s gestation period is about 425-496 days, after which a single calf is born. Subsequently, Zohari, was moved from the outdoor rhino habitat into an indoor area in November where video cameras were set in place for Wildlife Care staff to monitor her closely. While the calf appears healthy, and feeding well, the first thirty days will be critical for both mom and calf. Toronto Zoo Wildlife Care staff will continue to closely monitor Zohari and her calf in the maternity area, which is not visible to the public. Zohari arrived with her sister Sabi to the Toronto Zoo from Busch Gardens Tampa Bay in October of 2012 as part of a conservation breeding program loan. This is Zohari’s first calf, and he was sired by Tom, a 10-year-old male. 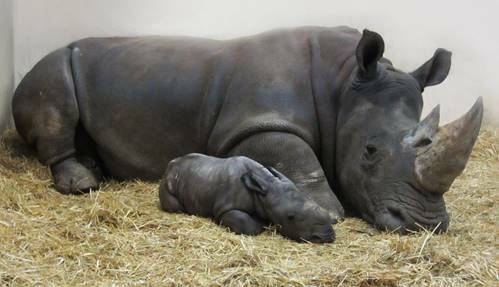 This is the fifth birth of a white rhinoceros in Toronto Zoo's history. The last white rhino to be born at the Toronto Zoo was a male named “Atu” born January 13, 1990. He left the Toronto Zoo in May 1995 and now resides at Parc Safari Zoo in Quebec. The Toronto Zoo is part of the White Rhinoceros Species Survival Plan (SSP), which aims to establish and maintain healthy, genetically diverse populations, and overall conservation efforts to save this incredible species. One of the Toronto Zoo's mandates is to educate visitors on current conservation issues and help preserve the incredible biodiversity on the planet. The Toronto Zoo is in a great position to bring forward the plight of the white rhinoceros and supports rhinoceros conservation efforts in the wild through keeper events and the Toronto Zoo Endangered Species Reserve Fund. Please note, Zohari and her calf are not currently visible to the public.